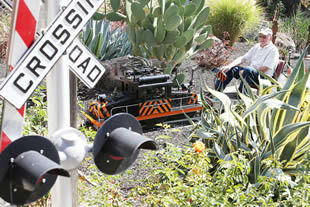 RMI Railworks Miniature train and railroad equipment In The News! 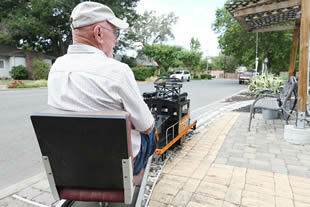 Ron Rogers rides his train along the tracks that run through the front yard at his home in Napa on Thursday. Red-and-white railroad crossing arms framing the driveway to Ronald Rogers’ north Napa home are for more than just show. Train tracks do indeed cross the driveway – 7½-inch gauge tracks. Rogers is the engineer and operator of his own, private railroad. He rode his train recently through his backyard and front yard. His metal, black-and-orange engine is a replica of the Sacramento-Northern 654, an electric train built in 1930 that once traveled the Sacramento Valley. The big difference is that Rogers’ version is only 3 feet tall and is powered by a car battery. If Rogers gets the urge to operate a full-sized train and see the county beyond his 1950s-era Hermosa Drive neigborhood, he can do that, too. He is an engineer for the Napa Valley Wine Train about three days a week. “I’ve been a train nut my whole life,” said Rogers, who on this day wore a Napa Valley Railroad baseball cap. He was born in 1940 and grew up north of Vacaville on a ranch that raised cows and turkeys. The Southern Pacific ran a train through the area powered by engine 1440. Rogers remembers the number well. “I saw it every day,” he said. The conductor would smile and wave as the train passed by. He would toss out a copy of the San Francisco Chronicle. He drove to the house once and asked Rogers’ mother for a date, but didn’t get one. Rogers received his first model rail kit at about age 7. “I took up the living room with my train,” he said. Trains took a back seat to a career as time went on. He worked for PG&E at the Vaca-Dixon substation, a landmark 1922 building with Classic architecture still standing along Interstate 80. He came to work for Napa County as a radio technician in 1967 and worked at Napa Sanitation District from 1977 to 1997. 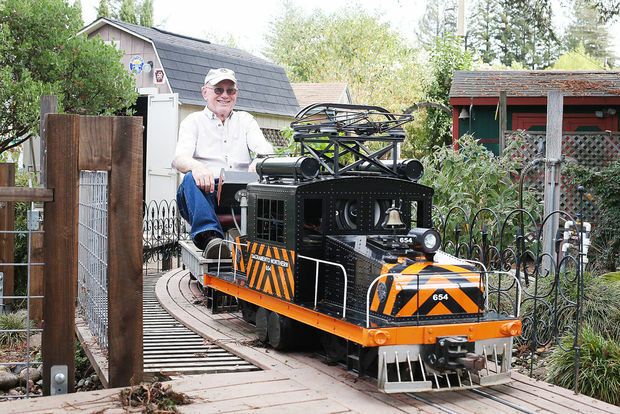 Rogers talked over the years about building a train layout in his yard. He had the room. At a little under a half-acre, his property is about twice the size of a typical subdivision lot. In the early 2000s, a key moment came. He and his wife, Morgan, decided to build a proper driveway to replace two strips of concrete a car’s width apart. “She said, ‘You’ve got to make a decision — either you have a train or not,’” Rogers said. Rogers decided to have one. He had the concrete driveway built with tracks embedded in it, something that would have been much more difficult to do after the driveway was in place. He and his friends set up tracks around the yard, with double tracking in locations. The company RMI Railworks provided the raw materials of Rogers’ dream – the engines and the cars and those crossing arms and other equipment. Rogers estimates he’s spent about $15,000 on his railroad. His imagination provided the course, which winds past cactus in the front yard and over a small, cascading waterfall that empties into a fish pond in the backyard. Rogers a few years ago had his lawns removed to save water, but the tracks remained in place. Trains in the real world are often stored and serviced in roundhouses and that’s the same in Rogers’ train world. He has a roundhouse with a railway turntable in front to take trains to various tracks inside. Both he and his wife have a train set so they can be their own engineers at the same time. Double-tracking in the front yard adds to the course’s complexity. It’s a kid’s dream come true, but Rogers’ children are grown up and he has no grandchildren. Still, kids find their way to his railroad. Rogers awards train rides as prizes for various fundraisers and gives rides during parties at his house. Rogers started building his own train engine about seven years ago, as opposed to buying one already assembled. He is far from being finished. “It’s a full-time job,” he said. And Rogers has another, non-train interest that could be a full-time job. He has a 1938 Ford delivery truck he wants to restore, one that has no windows and a metal surface of solid rust. In his youth, he drove it for chores on the Vacaville ranch. Then there’s his part-time job as Wine Train engineer. Rogers said driving the train isn’t as easy as it might seem. The engineer must always be using the brake and throttle to ensure a smooth ride so guests don’t have their wine glasses clattering. But then, driving his home train has challenges, too. The train has enough get-up-and-go that one has to keep the speed down around curves or risk derailment. Trains are hardly all romance. Rogers after his 1997 retirement worked as a conductor for the Burlington Northern out of Richmond. He didn’t stick with it. “I didn’t like the idea of never knowing when you’re going to be home and when you’re going to be working,” he said. These days, the train is at his home and he works on it when he pleases. The Opelika City Council approved a resolution at Tuesday’s meeting authorizing an agreement with RMI Railworks of Camarillo, Calif. to repair and restore the Rocky Brook Rocket. The Parks and Recreation Department began a campaign last June to raise the funds from private donors to complete the project without the expenditure of public funds. 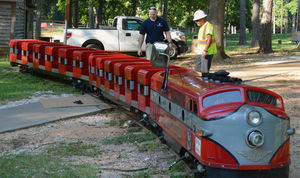 The miniature train, which has been in operation at Municipal Park since 1955, will require an estimated investment of $70,000 to be fully refurbished. A representative of RMI Railworks is scheduled to complete the initial inspection of the track and the Rocky Brook Rocket today. Matthew Battles, Municipal Area Supervisor for Parks and Recreation, said it will take approximately six months for the restoration to be completed and that the fully-restored Rocky Brook Rocket will be back in Opelika for use in the spring of 2016. 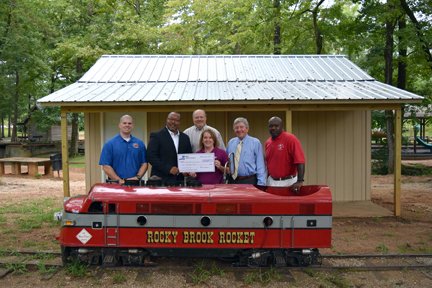 Afni, Inc.in Opelika, Alabama recently notified the City of Opelika that their company had decided to become Bronze level sponsor of the City’s energetic restoration project of the city’s historic “Rocky Brook Rocket” with their generous donation of $1,000. Pictured from left to right: Matthew Battles, Municipal Area Supervisor with Opelika Parks & Recreation, Vince Jackson and Robin Goodman (holding the check) of Afni, Inc., Parks and Recreation Director Sam Bailey, Opelika City Mayor Gary Fuller, and Assistant Parks and Recreation Director Tommie Agee. The Rocky Brook Rocket is scheduled to ship out to RMI Railworks in Oxnard, California around the first of September for restoration. They will be replacing the existing engine and drive system with a new,modern diesel/hydrostatic setup with air brakes. The restoration process will take approximately six months. The City anticipates getting the train back home sometime between late March or early April. In the meantime, RMI Railworks will be sending someone to Opelika to inspect the train tracks in Municipal Park, and to survey areas where the track could possibly be extended to run in the future. The new Train Depot for the Rocky Brook Rocket, which has been named “the Alligare Train Depot”, has been constructed by Long Buildings out of Smiths Station; Director Mike Hilyer and his ESG Operations / Team Opelika folks at Public Works built the extension for the train shed, which has been named “the Opelika Rotary Club” Train Shed, so that it will be able to hold the additional passenger car being added to the Rocky Brook Rocket. The whole restoration process is being filmed so that a documentary of the project can be created to document the city’s efforts to preserve one of Opelika’s unique treasures. Posted: Friday, August 28, 2015 1:00 pm | Updated: 3:21 pm, Fri Aug 28, 2015. Municipal Park’s beloved Rocky Brook Rocket is West Coast bound, traveling from Opelika to California for a full-blown, vintage restoration. The iconic Opelika train -- a staple in the community since 1955 -- was loaded off the tracks early Wednesday morning, and by Thursday, the Rocket was set to be en route to the Golden State for a restoration that officials said will aesthetically take it back to the 1950s, while equipping it with the modern technology it needs to remain in operation. Battles said RMI Railworks Industries, the California-based business tasked with restoring the Rocket, will also add a third car to the train, increasing its passenger capacity. The restoration will cost approximately $70,000, all of which Battles said was obtained through private donations. By the time the train returns to the park, he said those who contributed to the project will be honored by having their names displayed throughout the area. Battles said he expects the train to be back in commission by next May. Tom Plott, an Opelika resident who came to see the Rocket off, said some of his best childhood memories involve the train, and he’s happy to see the city taking measures to make sure it stays around for another 50 years or longer. Does your park, zoo, shopping center or business have an old MTC railroad that is showing its age? Do you have other miniature railroad equipment that is in disrepair? If so contact RMI Railworks for refurbishment and bring it up to today's standards of quality and safety. Let RMI Railworks make your railroad look good!